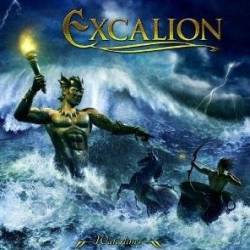 Waterlines is the second album by Excalion from Finland. And it's a fine example to show how melodic metal should not sound. Singer Jarmo Pääkönen seems to be very proud of his voice as it is more dominant than any of the instruments on the record. Furthermore, the mock-epic choruses are always so predictable that they annoy with their sugary stickiness. The choruses are never too long, but the same can't be said about the guitar solos from Vesa Nupponen that suffer from serious over-length. Most songs on the album are quite fast and harmonic but don't bring anything new into the genre of melodic metal. Ivory Tower is maybe the only track on the album which isn't disastrous. Especially terrible are the video edit Losing Time which is a mid-tempo song sounding like a beer commercial and the ballad Delta Sunrise which is as exciting as reading yesterday's newspaper. After ten songs, I was sure to give the album the lowest possible rating: one single point. But at the end, there was a small improvement thanks to the Finish version of Arriving As The Dark. The English version is just another track on the album not distinguishable from the others, but the Finish Yövartio is making the song more exotic. Eläkeläiset have often shown in the past that their maternal language is beautiful enough to be used in music. So if Excalion switched from English to Finnish and would use a more comic aspect like Freedom Call for instance, the band could become more entertaining. But I doubt that they will follow this advice.